Protect Your Home Against Mold & Mildew Effectively reduce indoor humidity and moisture with our patented products. Why use a SaniDry™ Dehumidifier? The SaniDry™ XP upright model is an energy-efficient basement dehumidifier. The cold coil (the actual thing that takes the water out of the air) is too small. The fan is too small (it has to be so it doesn't blow the air past the dinky coil too fast, otherwise it wouldn't take any water out!). The fan doesn't circulate the dry air around your basement - because it's too small. They usually aren't drained automatically, so the bucket fills up and they shut off. They are rated (25 pints, 30 pints, 40 pints, etc.) per day at 80 degrees air temperature. Warm air holds a lot more moisture than cold air. Put them in a 68-degree basement and their effectiveness goes way down below this number. Both the SaniDry™ Sedona and SaniDry™ XP blow their competition out of the water, pun not intended. The Sedona is Energy Star certified, has an automatic humidity sensor, and can even be ducted to reduce noise. The XP boasts even more features with a 109 pint capacity, a built-in defrost system, and a direct gravity drain hose. 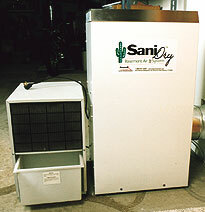 There is simply no comparison between a SaniDry™ Basement Air System and any dehumidifier you've ever seen. While we tend to be rather conservative about what a product can do, a SaniDry™ Dehumidifier always impresses.